Dental Implants are an option you may wish to consider to replace a missing tooth or teeth. A dental implant can be likened to having a full replacement tooth, both the visible crown and the root, placed directly back into your jaw. They are secure, durable, functional and beautiful. The term “Dental Implant” refers to a type of dental prosthesis (false tooth or teeth) that can be surgically implanted into the upper or lower jaw bone to replace one or more missing teeth. The “Crown” or “Prosthesis”, which may be either cemented to the fixture or held into place with a small gold screw. The fixture is implanted directly into the jaw and fuses to the bone. It becomes a replacement tooth root. A crown made of a precious metal alloy covered with tooth-coloured porcelain becomes a replacement for enamel layer of the natural tooth crown. The placement of the dental fixture is a surgical procedure, while the placement of the overlying abutment and crown, bridge or denture is very similar to the placement of the same types of restorations that are not supported by fixtures. Both procedures are explained on this page. How Long Does It Take To Get Teeth Implants? Every case is different. An uncomplicated case might be completed within six months. Complex treatments can take several years to complete. Implants are used to replace missing teeth. They are an alternative to dental bridges or dentures, and have significant advantages over both. However, there are also potential disadvantages that need to be considered. A denture is generally less stable and retentive than an implant. This can make it uncomfortable to wear and more difficult to eat. Dentures can affect the clarity of speech and the ability to taste foods. It is potentially embarrassing if a denture is easily displaced while speaking or during a meal. The placement of Dental Implants does not require the removal of enamel and dentine from adjacent teeth: implants are far more tooth-friendly than bridges. If you require dental implants, you will most likely be treated by Dr. Disha Kamath Naik, one of our Corinna Dental dentists. Many implant cases can be completed within our practice rooms under local anaesthesia. You can also request to have your dental implant surgery completed under Intravenous Sedation. Complicated cases will be referred to a specialist periodontist or oral surgeon, who will be responsible for placing the titanium fixture/s into the jaw. In most cases, the overlying crown, bridge or denture can still be designed and placed by Dr. Disha in our rooms. Are All Dental Implant Cases Straightforward? Unfortunately no. There are many factors that need to be taken into consideration, every one of which can potentially be less than ideal. This is why the dentist will spend time taking a detailed medical history, do a comprehensive examination and use several diagnostic tools to plan each implant case. Every patient who receives a Dental Implant will need to have a customised treatment plan: there is no such thing as “one size fits all” when it comes to replacing a natural tooth with an implant. Unfortunately no. Not everyone is a candidate for this type of treatment, and not everyone selects this option when presented with the alternatives. People under the age of 30 years can have dental implants, but there may be some special considerations for their treatment. Because the placement of an implant fixture requires surgery, there are inherent risks that you need to be aware of before you agree to treatment. Your dentist will explain all potential risks to you in detail during the planning phase of your treatment. You are encouraged to ask questions, and are welcome to seek a second opinion if you wish. Naturally, all practitioners and staff at Corinna Dental take your safety very seriously and follow strict protocols and standards to minimise all potential complications related to the placement of dental implants. Dental Implants cannot be removed for cleaning, but are designed to be similar in shape and size to natural teeth. In most cases, brushing and flossing are all that is needed to keep a single tooth Implant free of plaque. Sometimes the design of the crown or bridge creates spaces that are more difficult to clean: in this case, our dentists and hygienists will show you the best way to keep these spaces properly clean. 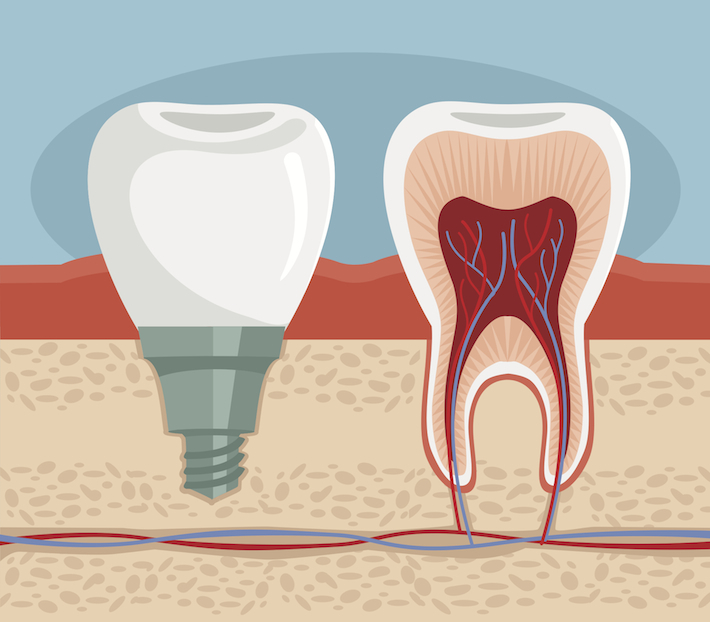 We explain post-operative care for dental implants here. Would You Like To Know More About The Suitability Of Dental Implants For You? Please call the Corinna Dental practice location of your choice and request a consultation appointment with Dr. Disha Kamath Naik.